I Got Free Pizza, But Macklemore Got The Last Laugh! I’m 67, and even I know who this is! And, this story includes him, eventually. First, the setup…. I’ve been eating the same hippie/vegetarian food since 1974. That’s a long time. — When I converted from the guy who needed to have meat every day, in order not to feel poor, to a guy who never, ever eats meat, I began putting together my own little 3-ring binder cookbook, full of easy recipes. Tip: if you convert to a vegetarian or vegan diet, it really, really helps to know how to cook for yourself. Kind-a sad. I can see the old title my late, ex-wife made on the other side of the paper. 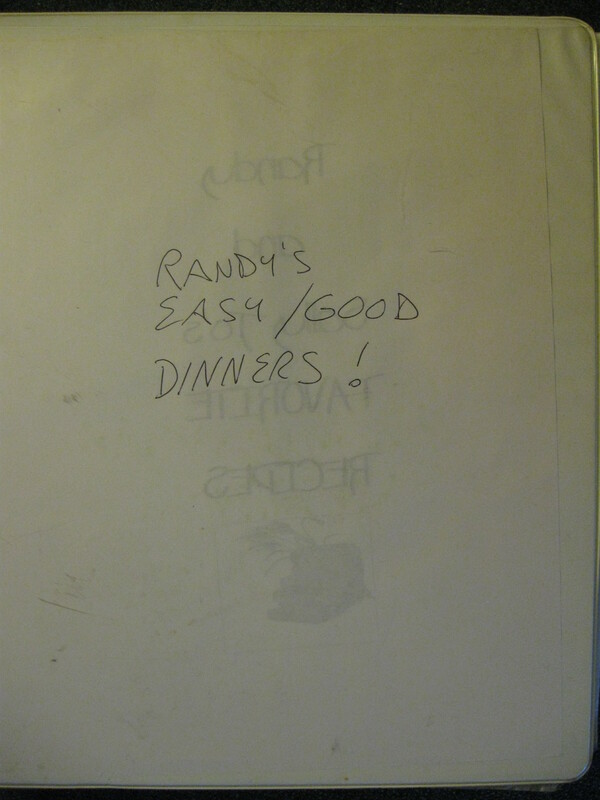 When I made the cookbook, I wrote “Randy’s Easy/Good Dinners!” on a piece of paper, and slipped it into the clear plastic cover. When I got married, my wife made a new label for it, which said “Randy and Sally Jo’s Favorite Recipes”. When we got divorced, I turned that piece of paper over, and wrote “Randy’s Easy/Good Dinners!” on it again. But yeah, it’s the same 3-ring binder, with the same recipes. And, I finally got sick of making and eating them. Black Beans Coriander may sound exotic. Baked Veggies a la Moosewood may sound mouth-watering good to you. But 42 years of eating those dishes over and over and over again can get to you. Well, it got to me…. 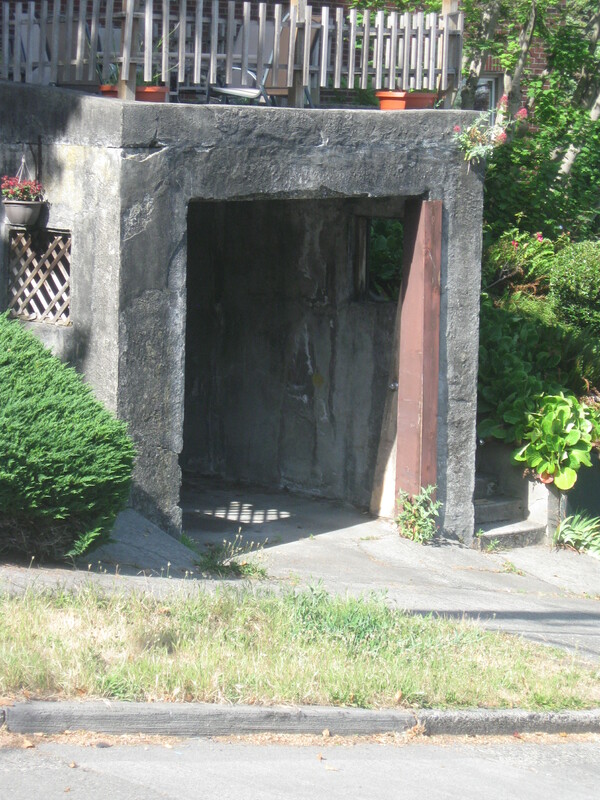 Coincidentally, right around the time I knew I couldn’t stomach one more serving of Lentil Loaf from the kitchen of Randy Bowles, I moved to a new neighborhood. I moved into a swingin’ senior apartment building (all but one word of that is true). 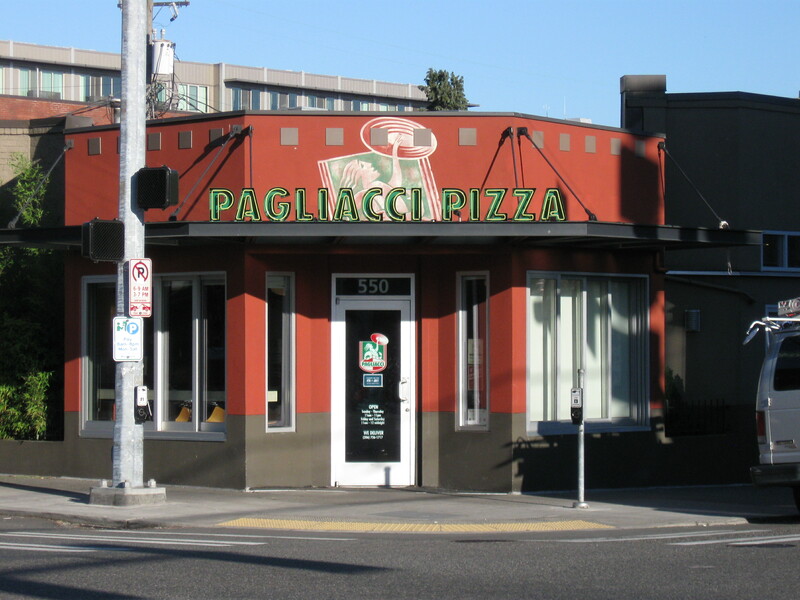 And, I found myself living within easy walking distance of one of Seattle’s favorite pizza joints, the near-legendary Pagliacci Pizza. — Hard to pronounce, harder to spell. Now, I was the kind of guy who never ate out, since I could cook. But, being sick of my cooking, I stopped in and bought a slice. And I was on my way to being hooked. 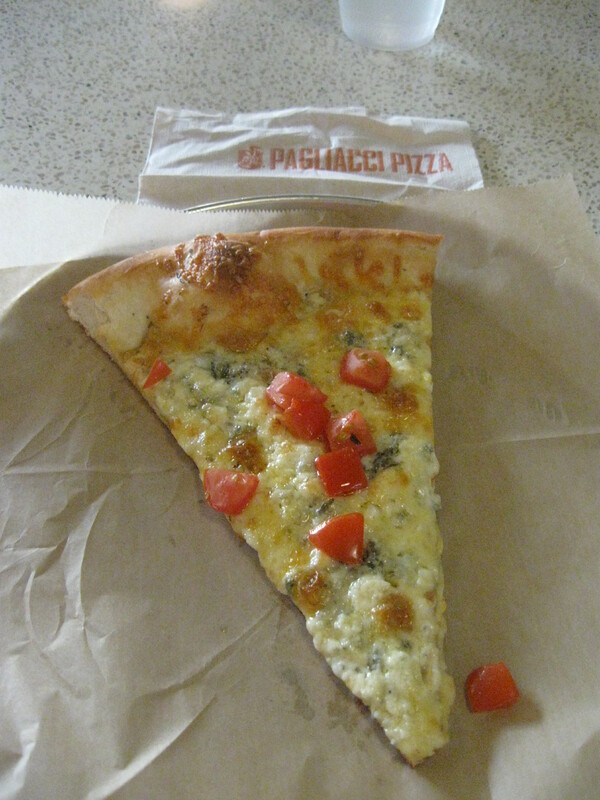 Pagliacci offers a different variety of vegetarian pizza each day, all delicious. I returned the next day, had a slice, enjoyed it, and walked home to do some figuring. First, I determined that, since I lived three and a half blocks from the place, I would get seven blocks of walking in every day, at a minimum. – A healthy thing. Then, I did some quick math. I realized that, if I could get by with one slice per day, I could eat at Pagliacci for the same amount of money I had been spending when I cooked at home. So I decided I would just eat pizza for a while, and see how that went. A Lower Queen Anne anchor tenant for over thirty years. Well, one evening, I dropped in, around 6 pm, for my now-customary slice. 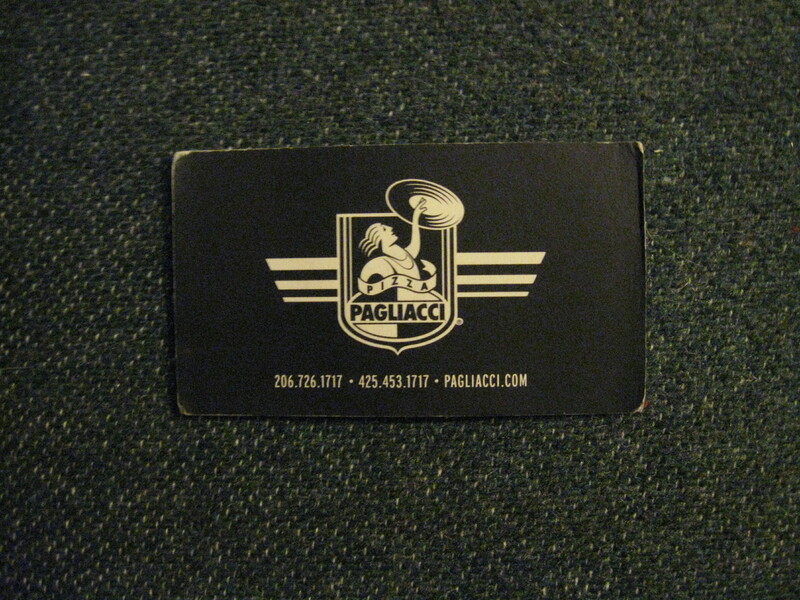 Since I was an every-day guest, I had learned to take advantage of the Pagliacci Slice Card promotion. The place gave out these little cards, which the cashier stamped every time you bought a slice. After you bought twelve slices, the next slice would be on the house. So there I was, in line, just standing there, quietly waiting my turn to order, not bothering anyone, not really paying attention to my surroundings. But then, I did. 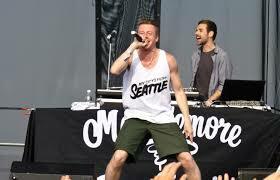 Because I noticed that the guy in front of me was Seattle’s own Macklemore. He was handing one of my Pagliacci friends a small wad of bills, with which he paid for his order. My friend thanked him, and told him how much she enjoyed his music. He quietly thanked her, and walked over to the soft drink dispenser to serve himself a cold drink. I walked up to the cash register and handed my completely filled-in Slice Card to my pal, in order to get my free slice of pizza. She gave me a sweet smile, and said, “Thanks, Randy. Here’s your free pizza”. I took it from her, and then, I laughed out loud. I said, “It’s funny. Macklemore had to pay for his slice, and I got mine for free”. At that point, Mr. C, shift leader, and no relation to the above-mentioned Ms. C, walked over and said, “That’s because he’s Macklemore; and you’re Randy Bowles”. I broke out in an even bigger grin and started to walk away with my free pizza. Young Mr. C winked at me, and said, “And besides, I think he can afford it”. Tragically, I had to quit eating at Pagliacci. I mean, I had to totally walk away. Forever. Because I got too fat, even on just one slice per day. All that cheese, I guess…. I have about twenty pairs of pants — everything from Dockers, to cutoffs I made myself, to overalls. When three-fourths of them stopped fitting, I knew that was the end. I had the Dunlap Effect. 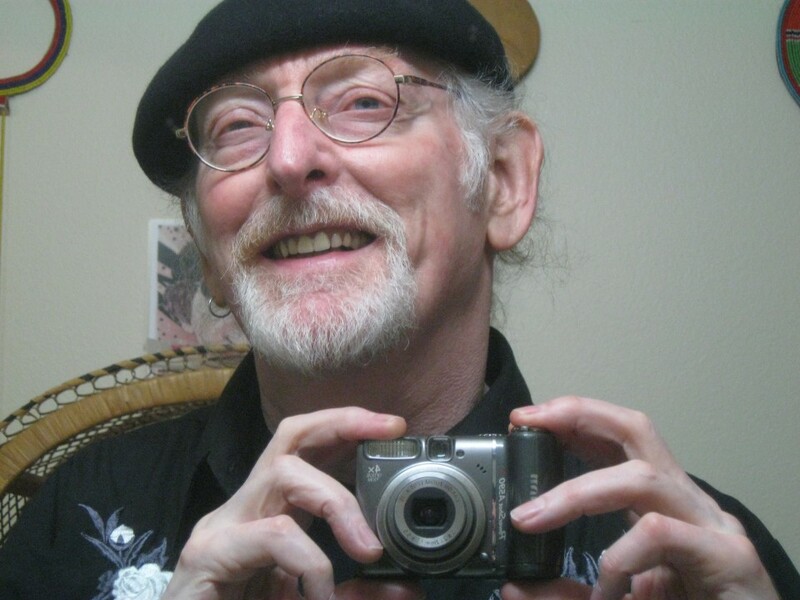 My belly Dunlapped over my belt…. 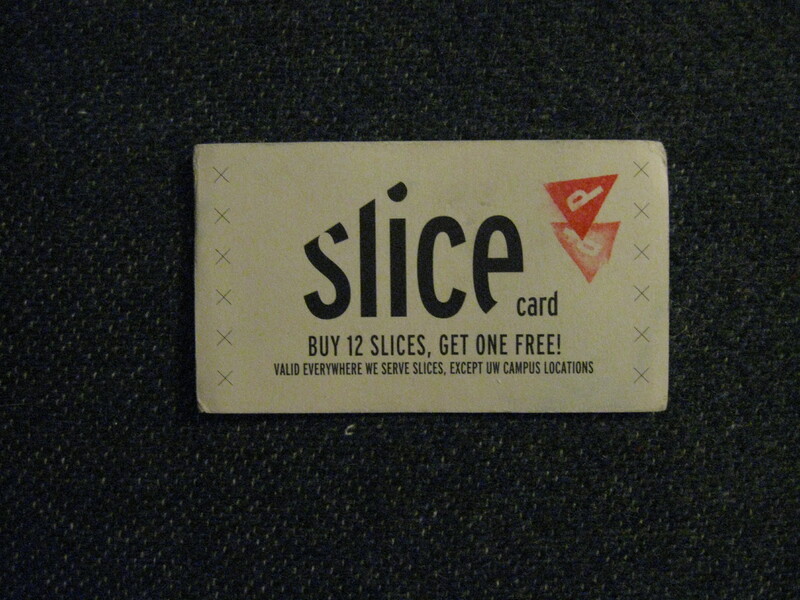 The above-pictured Slice Card will never be filled out. When I die, and they haul me out of my senior apartment, and go through my things, someone will say, “Hmm, he had ten slices to go”. As they slip it in their pocket. I saw a photo of Macklemore the other day. He looked slim and trim. — I guess he got the last laugh. It was a lucky coincidence that I had twelve stamps on my Slice Card when I went for pizza that evening. Otherwise, I would have no story. I mean, I could say, “Hey, I saw Macklemore at Pagliacci”. Big deal…. I saw Queensryche at a local cafe in the mid-80’s, and nothing happened. I know you expect me to put a link to a Macklemore video here. Instead, you get a folksinger named Christine Lavin, singing her original composition about how well-rounded pizza will make you. It will! 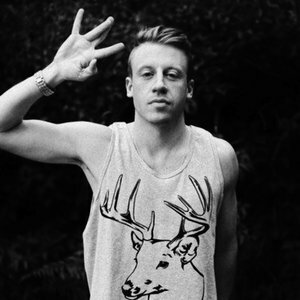 PS: What is my favorite Macklemore song? This may be no surprise to you: Wings. You’ve seen them. What are they? Well, back in the day, they were installed high upon the cross-arms of wooden utility poles. They’re insulators. 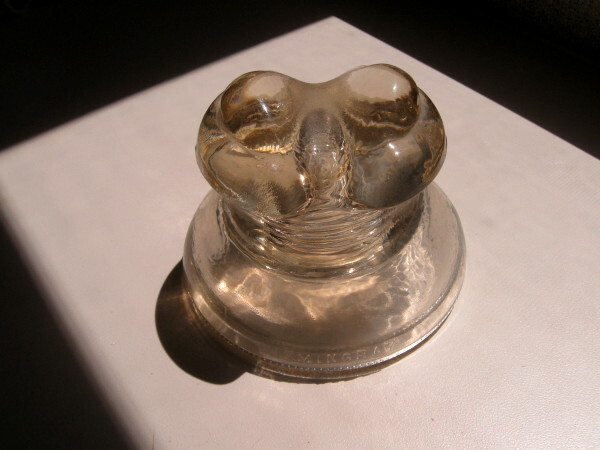 As my public service, I’ll share a little bit about insulators, so that, if you put some in your place, you’ll be able to tell people what they are. And no, I wouldn’t bring up the subject at a cocktail party. Unless you see me there. This pretty one has multiple skirts and a slotted head. 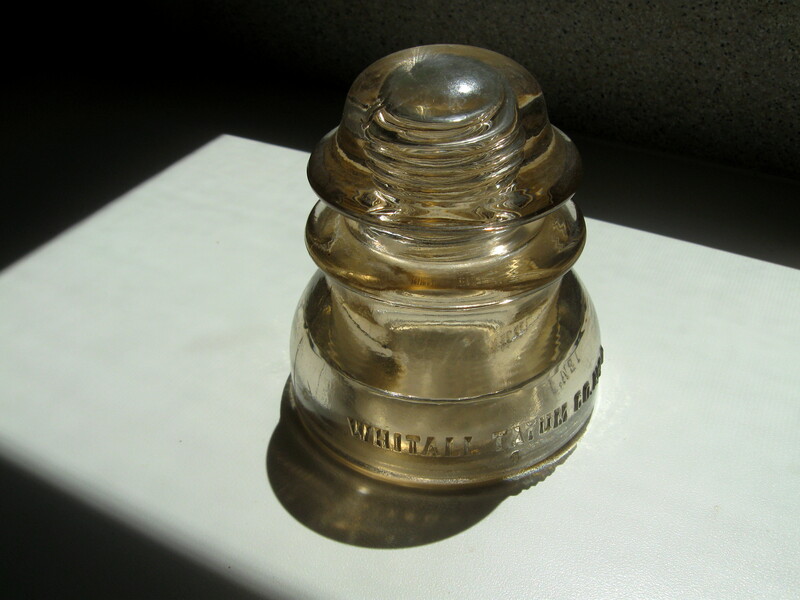 These glass (and porcelain) insulators were used by the telegraph, electric power, and telephone industries. They were made by the same companies who made art glass: beautiful objects of decoration, and useful objects such as pitchers, drinking glasses and tableware. 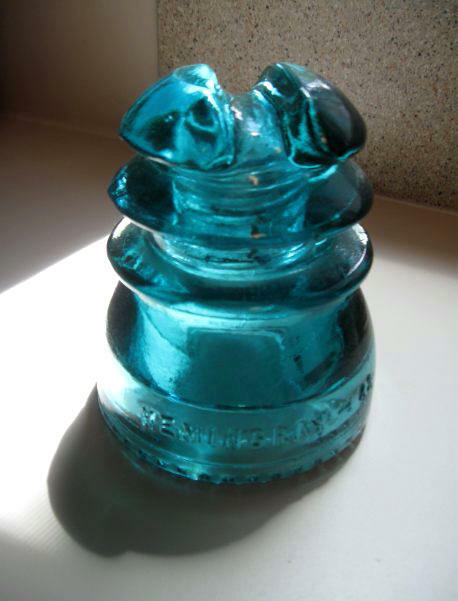 They were contracted to produce glass insulators. Here are two examples of art glass: a family piece of EAPG, and a stock photo of hobnail glass (I had a piece, but stupidly sold it!). 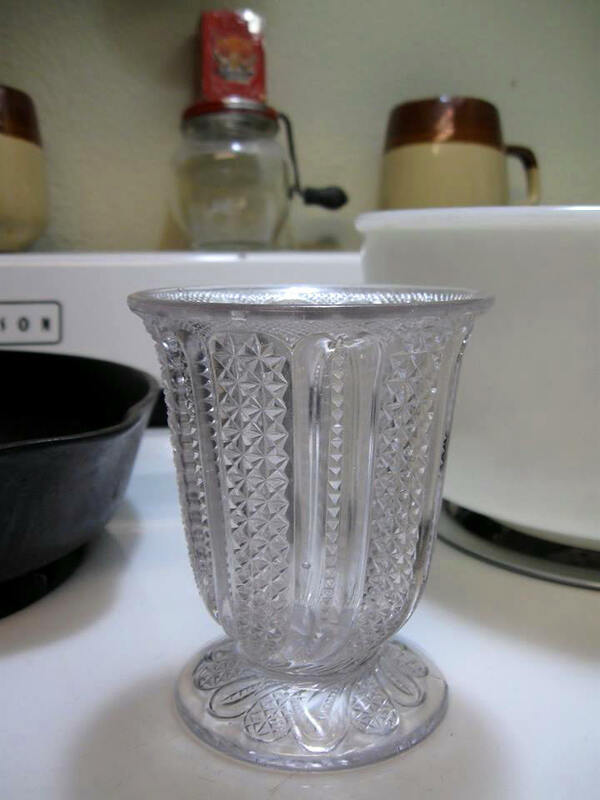 My 1891 Beatty EAPG Pattern Glass Feather Fine Cut spooner from my mother’s family, is beginning to turn purple with age (chemical changes). 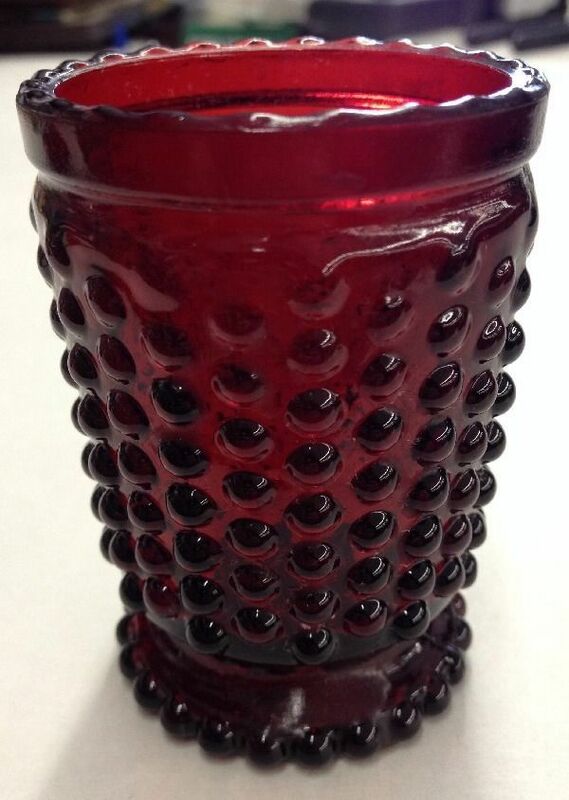 This vintage hobnail glass toothpick holder has features similar to the following insulator. I’ve displayed this one on its side to show its hobnail-patterned base. Due to conductivity and/or interference issues, you don’t want to just nail a wire to a wooden pole. You need something between the pole and the wire. That’s where these “crown jewels of the wire” came into play. Many people, including me, collect them for their beauty. We also collect them simply because they’re interesting objects. I’ve never climbed a telephone pole to string wire; I’ve never gone “searching for an overload”, like the Witchita Lineman; but I think glass and porcelain insulators are really special. 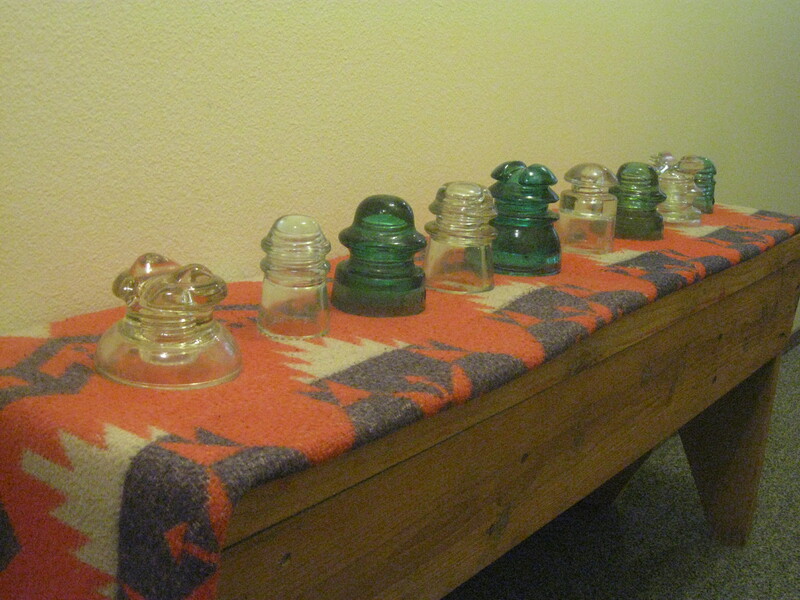 Insulators can be found in many colors. But there is no color coding involved. Basically, the colors don’t mean anything. I think it’s great that they come in colors, for no reason at all. 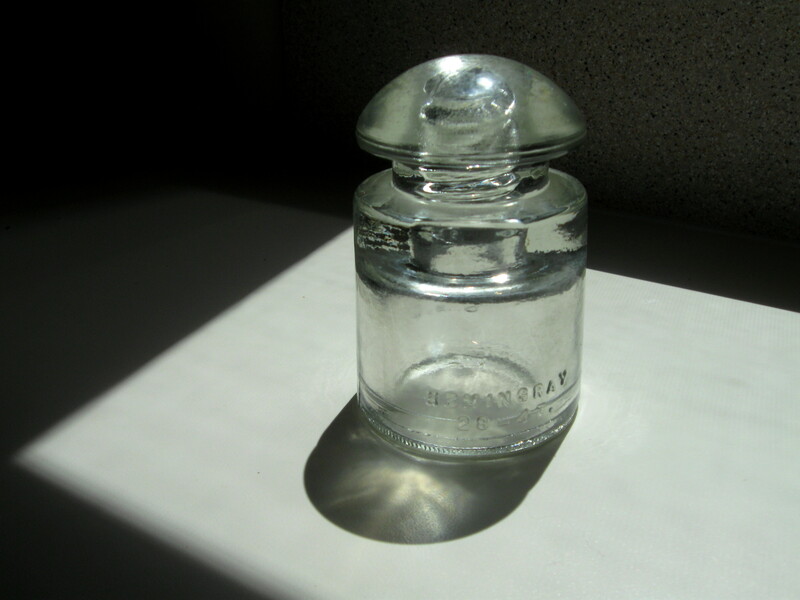 — Well, there is one reason: since glass houses made both glassware and insulators, they would use the leftover glass from their art glass-making process to produce insulators. Which does account for some insulators’ exotic colors. Here’s a rather complex one. They were made in many different styles, depending on what kind of wire they went with, and how the wire went around/through them. Many different companies made them. I don’t collect any certain company’s product. I’m not a nerd about it. I just like having pretty, unique things in my décor. I don’t know much about the porcelain type of insulators. I only own a few. Most of the ones I see come in basic brown; and I’m looking for something different. 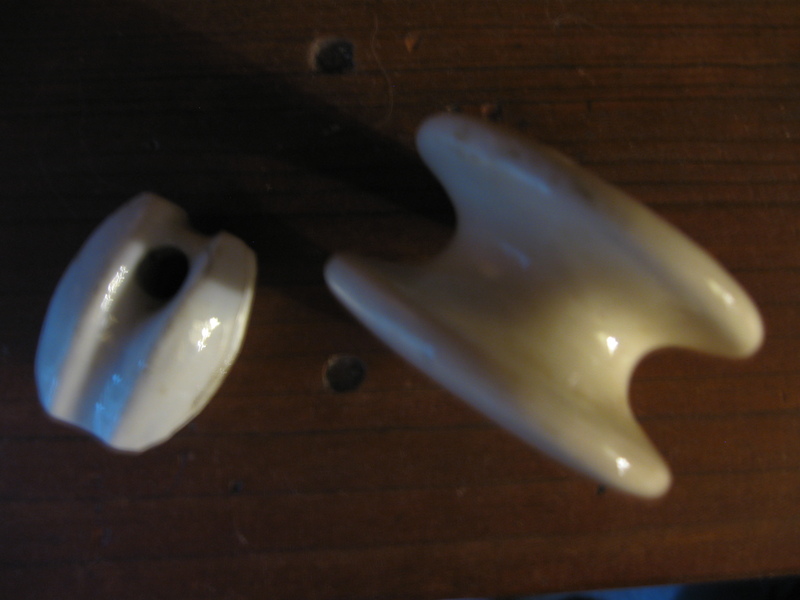 (Last September, I passed up a chance to buy some beautiful off-white porcelain ones at a Puyallup, WA antique mall. 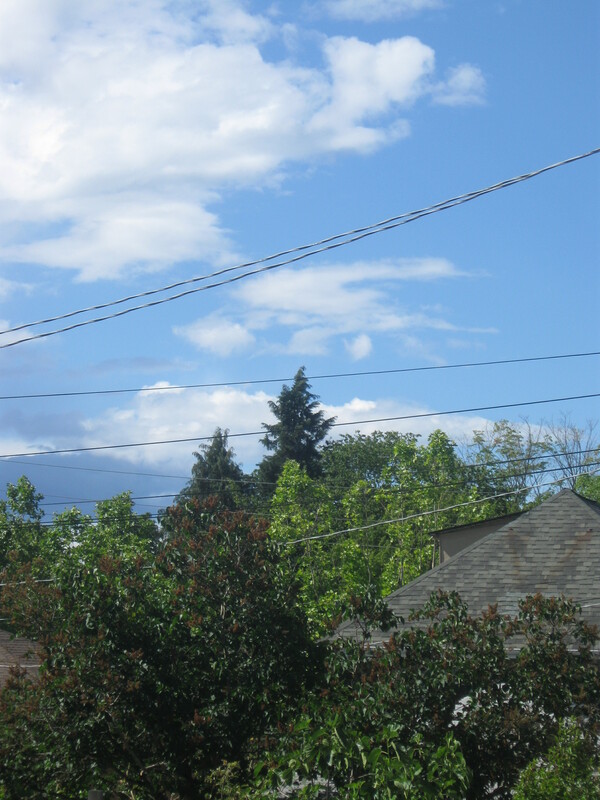 I don’t live near Puyallup; I am still kicking myself.) 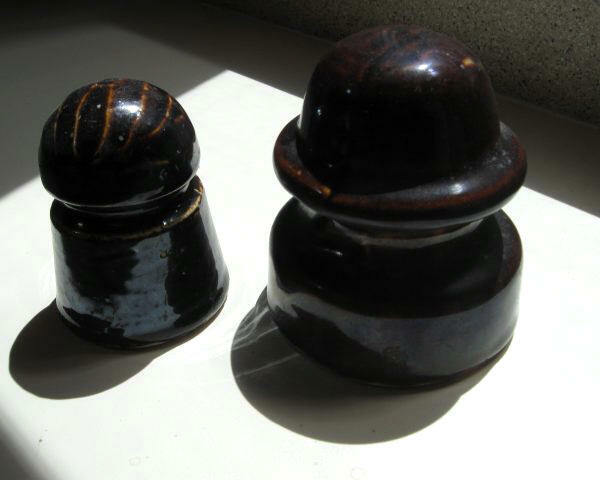 I did manage to learn that porcelain insulators were introduced because the protective properties of porcelain proved superior to glass. But I don’t know what that means! I’m an art collector, not an electrical engineer. 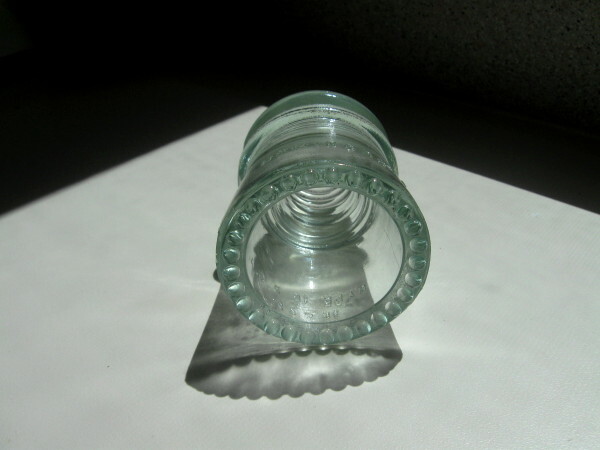 But glass ones, which were first made in the 1800’s, for telegraph poles, were eventually phased out — by the 1970’s — making them rare. 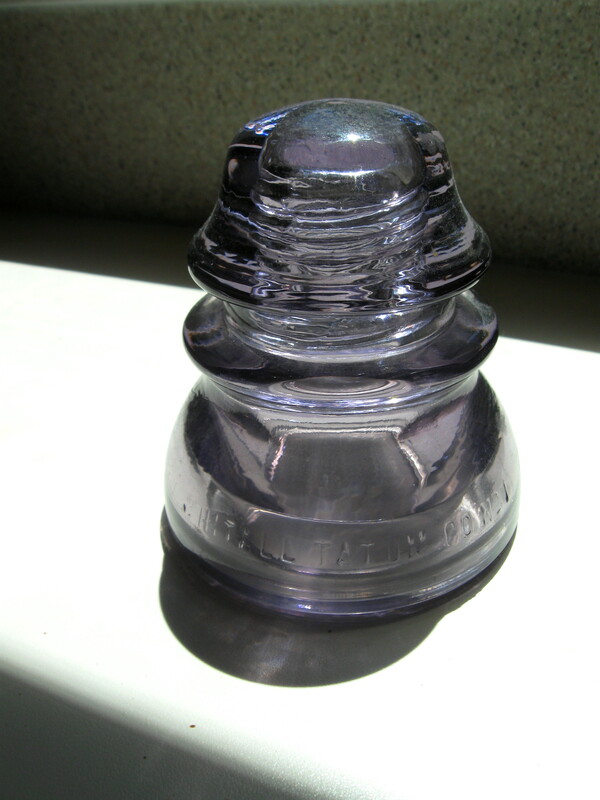 Porcelain insulators are still being made. For the beginning collector, porcelain can be more affordable. 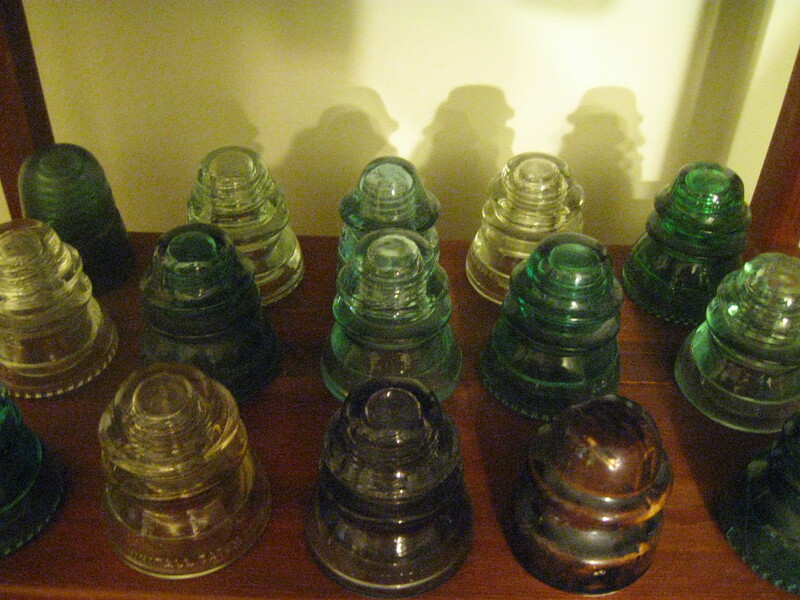 You may have seen some of these insulators in an old man’s garage. But take them out of the garage, dust them off, put them in an out-of-context spot in your abode, and you have an attractive conversation piece. 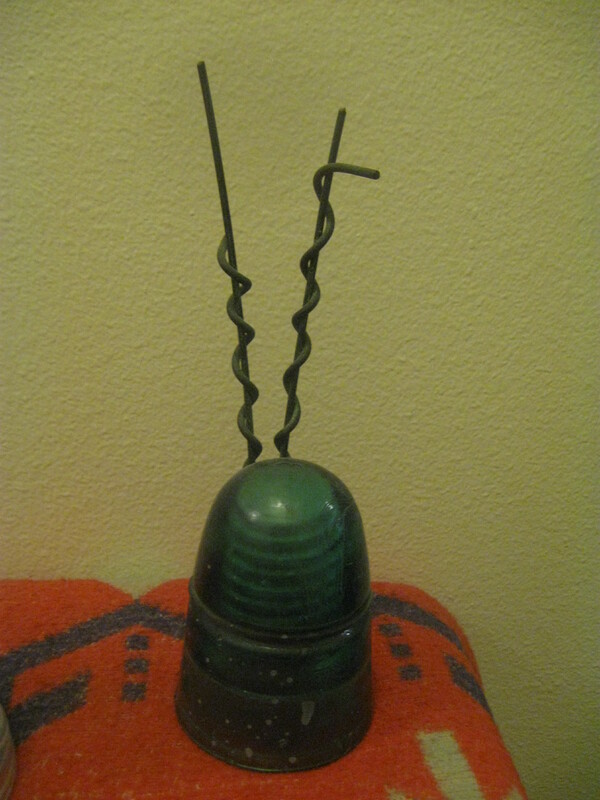 I can’t show you a photo of one of my insulators against a minimalist, industrial-design background, because I collect hundreds if not thousands of vintage items. I’m not into minimalist, industrial design. 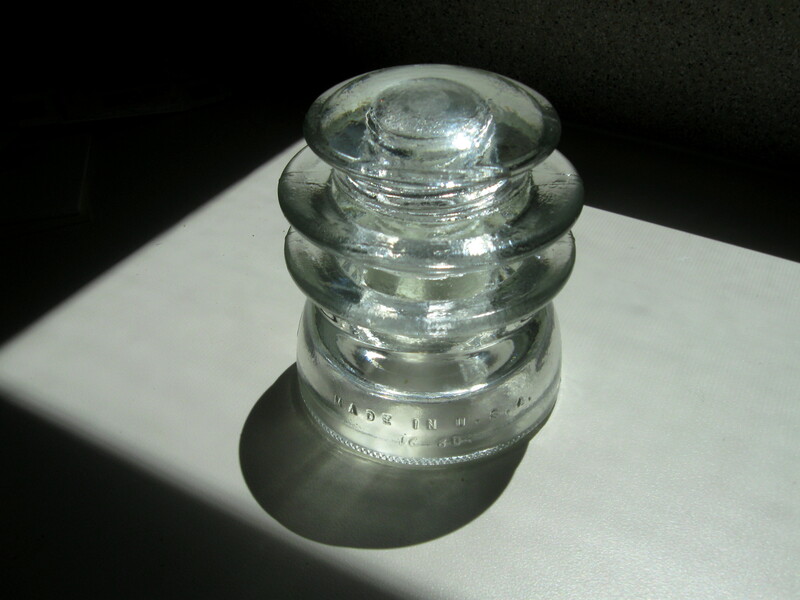 But if you have that kind of décor, insulators would go nicely with it. — I believe the #1 way to employ them in a modern interior is to convert them into pendant lights. This is becoming quite common. Turn one into a pendant light, and its value can go way up (unless you do that to a very rare example — those should be left as-found). 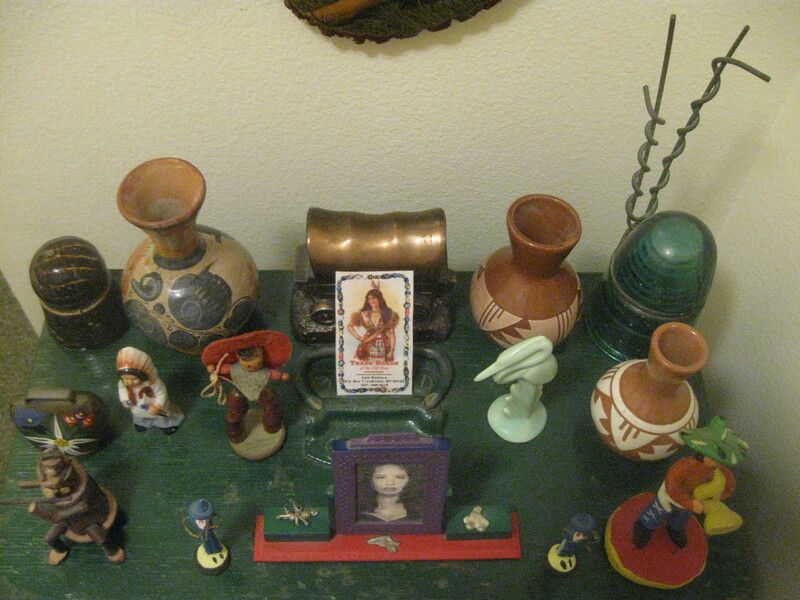 Just a small part of my folksy/homespun/rustic décor, with insulators, which I use to camouflage my blah-partment. These are displayed on my beacon blanket which I’ve had since 1952. You can see how I’m into the true vintage feel. I wish the hues of this beautiful cream-colored one would come through in the photo…..
Where to find them: antique malls, flea markets, auctions, second-hand stores, garage sales. Isn’t that where you find anything cool? Here is another cream-colored one; a really wild one. I’m putting photos of as many of my good ones as I can squeeze in here…. The wires attached to this one make it unique. I’ve seen these used to hold photographs. 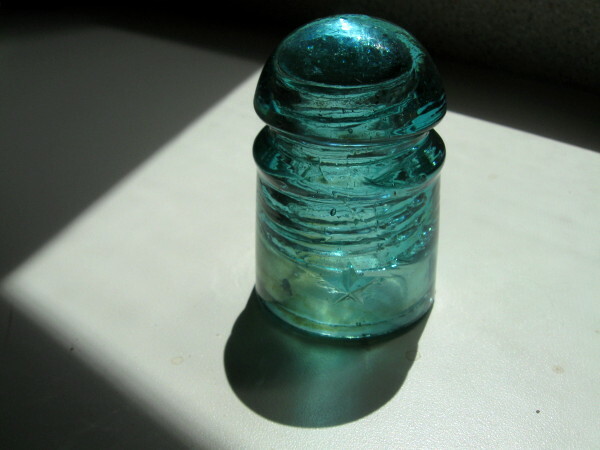 How I got into collecting: I started collecting insulators in the late 1980’s. While “antiquing”, I would see them sitting on the shelves. For something so pretty, and interesting, they were always priced reasonably. I started picking them up. I slowly amassed a small collection. I’d say most of mine are from the 1920’s-1950’s. — One day when my wife and I went to a local auction, I noticed that a whole box of them had been placed in the auction. I took a good look at them at the auction preview, found them to be in great condition; and later that day, I picked them up for a song! The auctioneer, after hitting the gavel, said, “Nice buy!” Well, she didn’t usually make comments. So I will take her word for it. — I got a nice buy! That purchase really bulked-up my collection. 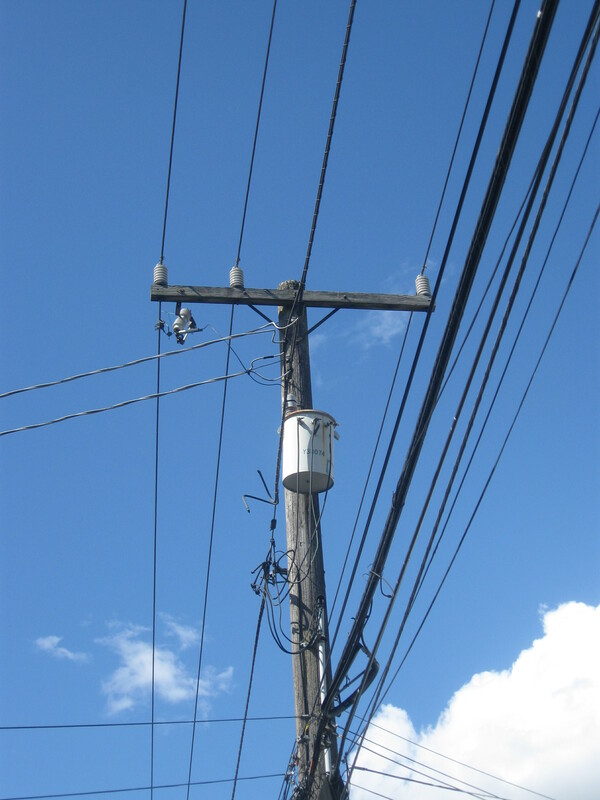 This modern-day utility pole is outfitted with modern-day insulators. The old glass ones are for collectors and repurposers, now. — It looks to me like they’re using a variation of the porcelain or ceramic ones here. I can’t help but wonder how long telephone poles/wires will last? I can’t imagine anyone having a land line ten years from now. I recall visiting with a young friend back in 2002 or so. He told me he only had a cellphone. I thought how odd that was. Now, of course, I only have a cellphone. This has been the case for five years…. I’d love to see all of those poles and wires gone. I’m a photographer; I’ve had more photos ruined by wires. I looked it up; basically, we still have telephone poles for economic reasons. Electric companies use the wires to deliver electricity to our homes and businesses. It’s very expensive to bury the wires. — Although, that’s being done more often. I think the poles will eventually go. 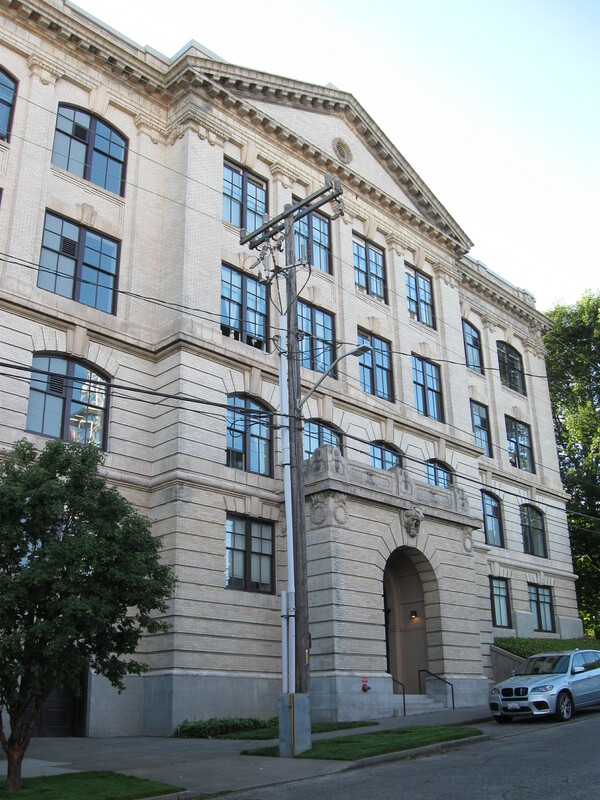 We’ll have to collect photos of telephone poles…. Ruined by wires AND pole! And the car doesn’t help…. 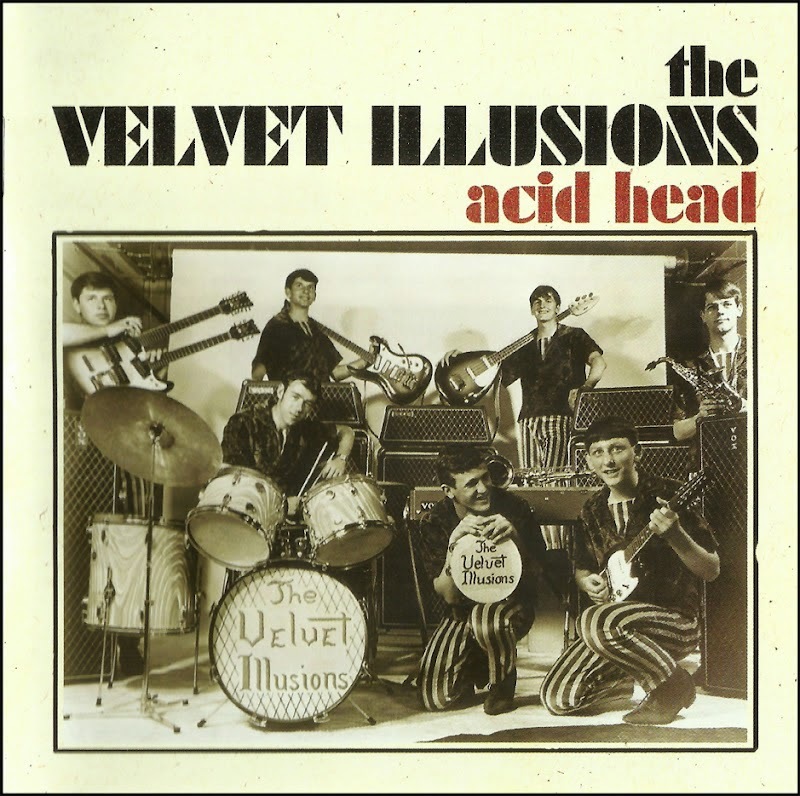 Update: With a little help from my friends: 1) My friend Gray, who lives in London, and who produced my 1960’s band’s retrospective CD (The Velvet Illusions’ “Acid Head”) actually dug these up in London, about twenty years ago (see above). He recently shipped them to me, as a gift. They’re porcelain, and very different from anything else in my collection. 2) My friend Clyde, who has a vast knowledge of vintage items, sent this Space Age beauty all the way from Tennessee, as a gift. I think its design is fabulous. 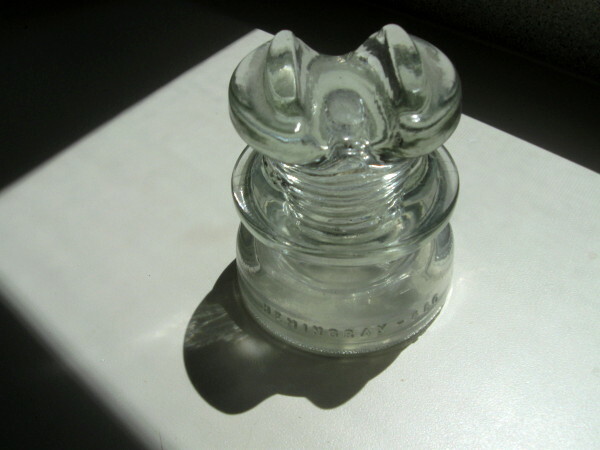 With its double-ringed top, this mid-century insulator was mainly used on rural telephone lines. Per the Hemingray Info website, “This style was used for swapping the positions of two lines. This would reduce the interference that would otherwise be caused by two lines running parallel to each other for too long a distance.” — I haven’t been able to add many insulators to my collection lately. But thanks to kind, generous friends like Gray and Clyde, I’ve added these excellent examples, which I will treasure. BTW, I haven’t listed all of the names and ID numbers of these insulators. I’m tryin’ to keep this fun, casual, non-nerdy. Yes, most of ’em have names and numbers on them. If that interests you, you can always leave a comment and ask me for that info. I took all of the photos for this story, except the one of the ruby glass toothpick holder. And, then, my camera broke! The Velvet Illusions’ Hometown Paper Has Published A Story On The Group! Our 2011 retrospective CD cover. On the Tune In label.